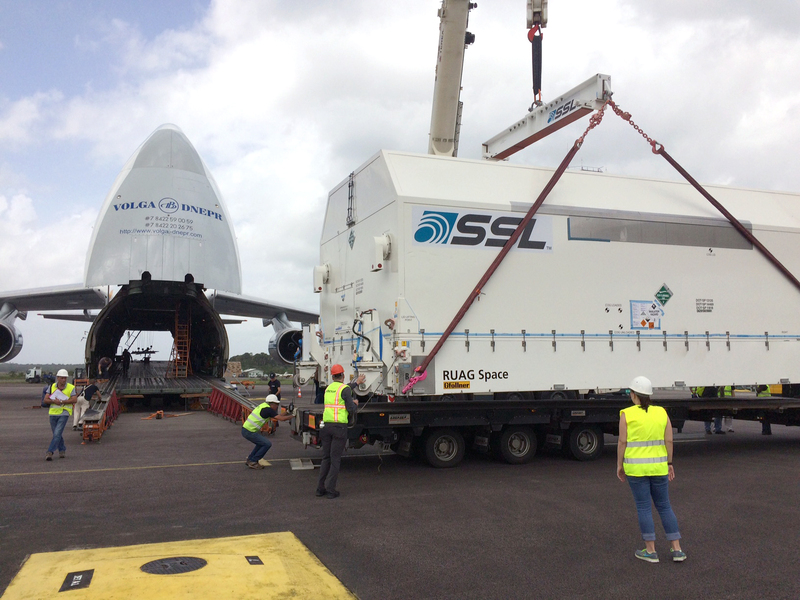 The telecommunications satellite for Arianespace’s second Ariane 5 flight of 2016 has arrived in French Guiana with the delivery of EUTELSAT 65 West A to the Spaceport. 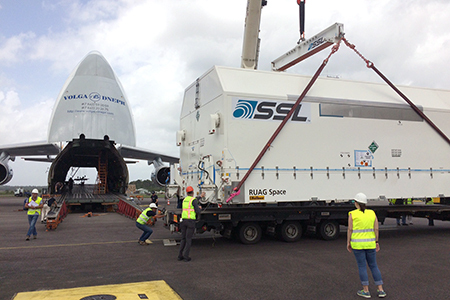 Transported aboard a chartered Antonov An-124 cargo airliner that touched down at Félix Eboué Airport near the capital city of Cayenne on Friday, the SSL-built (Space Systems Loral) satellite was then transferred via road to the Spaceport’s payload preparation facilities. At Félix Eboué Airport, the protective shipping container with EUTELSAT 65 West A is moved from the An-124 cargo airliner to a flatbed truck for transfer to the Spaceport by road. EUTELSAT 65 West A began initial pre-launch processing during the weekend, including a fit-check with the adapter that will serve as its interface with Ariane 5. Based on the SSL 1300 satellite design, EUTELSAT 65 West A will be orbited on an Ariane 5 mission in early March from the Spaceport – designated Flight VA229 in Arianespace’s numbering system. Scheduled to be this year’s second Ariane 5 mission, the launch will keep Arianespace on track for as many as eight with the workhorse vehicle in 2016. Once orbited by Arianespace, EUTELSAT 65 West A will be added to the in-orbit fleet of Paris, France-based Eutelsat, which supplies satellite capacity and services for video, data and broadband applications. When operational at an orbital slot of 65 deg. West, the new relay platform will serve expanding markets in Brazil and across Latin America. It combines broad coverage in C- and Ku-bands for video distribution, cellular backhaul and direct-to-home broadcasting with a high throughput payload for broadband access in the Ka-band.